After making myself physically ill with experimental "Bean Patties" I understandably began questioning the wisdom of me being in the kitchen. Curled up on the living room carpet with my aching stomach I had to smile at the utter ridiculousness of it. I mean, what kind of cook gets sick on their own cooking? A bad one apparently. Oh well. I didn't take it too much to heart and endorsed Mother's decision to feed the poison patties to the birds. A week later, I am happy to report, I somewhat reclaimed my status in the kitchen. Mom had bought Tempeh as a treat. Not having a clue what to do with it, I did some quick hunting on the internet. In the end I went with a recipe I hoped tasted as good as it sounded: "Tempeh Curry with Sweet Potatoes and Green Beans". It did! I substituted key ingredients, burned the Tempeh and over-filled the pan, but even I couldn't ruin it! I can relate: this week I obtained three jicamas on a good sale and tried to turn them into hash browns... I guess it wasn't a total flop, because I didn't get sick, but have you ever had crunchy, slightly sweet hash browns? Not stellar. 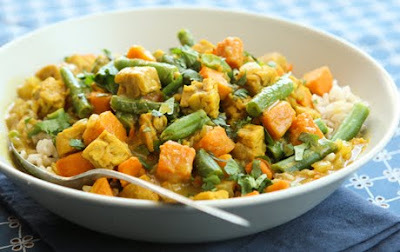 Your tempeh on the other hand looks delicious--and nutritious! Hehe. Isn't it awesome that a few mishaps won't determine your culinary career? I remember some very very botched things that arose from my kitchen ;-) Looks good! This blog didn't convince me one bit. I have had your food, Ms. Heather. Lentil soup? Oh my. Yours is the best.